Whether belaying a leader or holding a toprope, the belayer must be attentive, keeping the rope in the Goldilocks zone where it is neither too taut to assist the climber, nor too slack to cause them to hit the ground or strike a ledge. When you are climbing don’t be afraid to tell your belayer to you slack, or reel it in. Photo: Mike Hopkins. On May 27, 2017, John Conzone was toproping Nuclear Cottage Cheese, an 80-foot 5.9+ trad route on the back side of the David’s Castle Wall area, in western North Carolina. Providing sport, mixed and pure trad routes within the Crowders Mountain State Park, the area is a popular spot for Charlotte daytrippers. At the time, Conzone, age 60, had been climbing for five to six months. 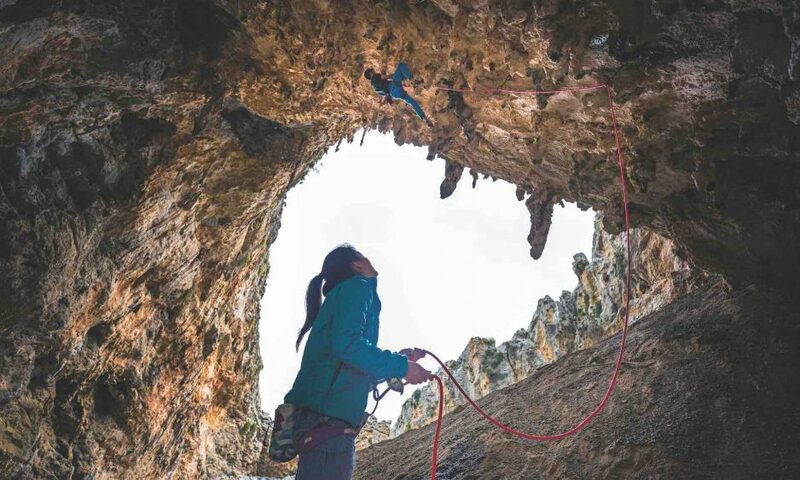 His partner, age 55, with eight years of climbing experience under her belt, was belaying him. Conzone was about 60 feet up Nuclear Cottage Cheese, a route involving blocky climbing and a small overhang, when he fell above a ledge on a section with a hand crack and smears for feet. “While I’m sure my perception of time is off, there was a brief free fall,” says Conzone. 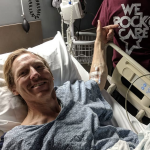 “Then the rope caught and stretched a bit and my right foot hit a ledge, and the pop was loud and clear.” He taped up his leg, and hiked a painful three miles to the car. His right tibia was broken in two places, and he was out for months. Falling on toprope and breaking an ankle or leg isn’t unusual, whether you are in the gym or at a crag, despite being largely preventable. A few factors need to be considered in Conzone’s accident. First is the weight difference. Conzone, weighing around 220 pounds, was belayed by someone on the ground who weighed roughly 120 pounds. Depending on the anchor configuration (rope friction in the anchors) and terrain, weight may or may not have been a factor. The belayer was not anchored in below, but Conzone said that she did not lift off the ground when he fell, at least to Conzone’s knowledge. The second factor is slack in the system. After post-facto conversations with his belayer, Conzone said that his belayer did not believe she had too much slack in the system. 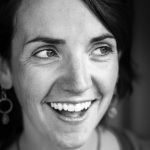 Conzone does think slack may have been an issue, however, saying, “When I first started up I had to get her to take since there was slack.” After that request, Conzone didn’t ask for slack to be pulled out of the system again. 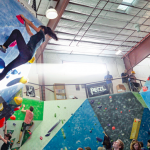 If there was extra slack in the system, it would have been extra easy for a 220-pound climber to lift a 120-pound belayer, which would make a fall feel faster than just rope stretch. Rope stretch is the third factor. Conzone’s weight would have stretched the rope more than someone who weighs 150 pounds. Conzone reported that he fell when he was three-fourths of the way up the route, where he would have had about 100 feet of rope in play. Conzone’s rope was a new 70 meter 9.7mm rated with 8.9 percent static elongation. This does not mean that rope stretch would have been 8.9 percent or roughly nine feet, however, since static elongation tests don’t use a toprope configuration, and we could only apply dynamic elongation if there had been slack in the system. Assuming some friction at the anchors, Conzone’s rope would have stretched minimally. While doing the math on elongation will provide some interesting results, rope stretch merely exacerbated the situation. A combination of slack, stretch and simply falling at the wrong place—above a ledge—at the wrong time caused this accident. Climber awareness would have been crucial in this scenario. 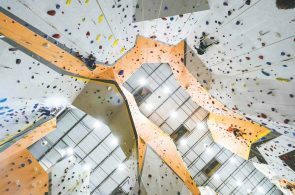 A belayer 50 feet below is unlikely to be able to determine if the climber is within range of striking a ledge. 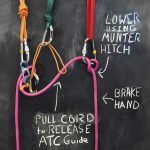 Climbers need to be fully aware of their situations and give their belayers a heads-up to “Keep it tight” when they are in vulnerable positions. 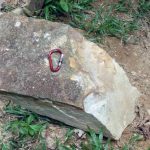 And while a soft catch is the preferred method of belaying for lead climbing, seldom, if ever, are there good reasons to have a loose belay (excess slack) when toproping. 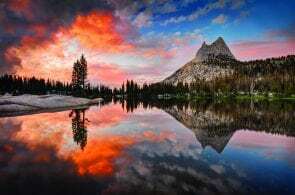 Also, climbers who are significantly heavier than their partners should take into account rope choices more than most (thicker ropes stretch less than thinner ones), and the belayer should usually be anchored. In general, and especially if there are ledges to hit or a crux is only about 10 feet off the ground, a heavier climber should think about how much friction is in the system (friction will help keep the belayer from being lifted), how much stretch is in the rope, and when it is critical to have a taut belay, as when they are climbing above a ledge and at their limit. 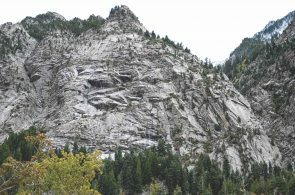 Rockfall is becoming more and more an issue in climbing. Learn how to protect yourself.